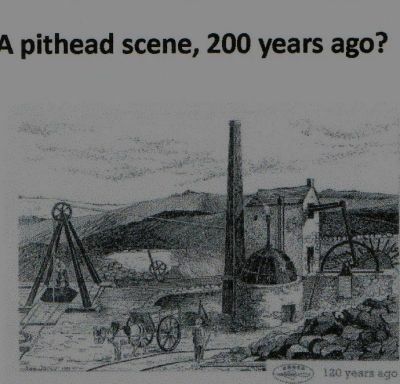 The old British Colliery, Coed y Go was opened shortly after 1833 by the Croxons but during the 1850's they abandoned the pit and confined their activities to the Drill pit. In 1860 Thomas Savin leased the mineral rights of Coed y Go farm from the Lloyds of Leaton Knolls. At the outset, he mined the same workings which the Croxons had operated and the enterprise proved successful. Mr Savin bought the mineral rights outright in 1861 appointing his brother Mr William Savin as manager. Later he sank a new pit - the New British, or Gate Pit - so called because it was opposite the entrance to Chain Lane with its turnpike gate. In order to furnish the necessary funds he handed the deeds of the colliery to the North and South Wales Bank. 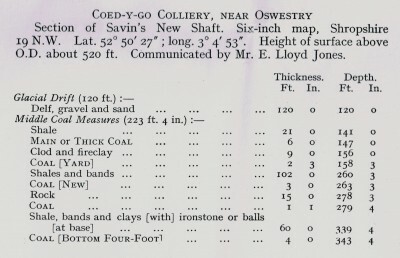 This colliery was run on more up to date methods than was the case at the Drill, for Mr Savin with his genius for Railway construction very soon conceived the idea of a railway running from the colliery to Porthywaen by which coal and bricks were taken to the main line at the Cambrian Railway This line was opened on 31st March 1863,, using three engines, " Plasfynnon" (named after Savins house in Middleton Road, Oswestry, "Milford" and "Little Tiny". Round about 20 trucks a day were despatched to Porthywaen. Soon after however Savin,s financial empire collapsed, the mines closed and the railway also closed in 1869.. The deeds to the collieries were taken by the bank who later sold them to the Lees family. 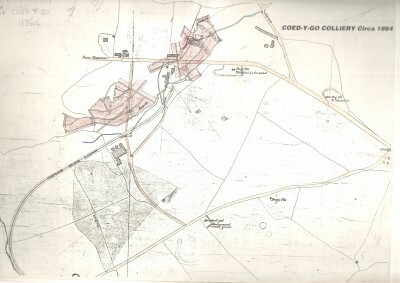 Copy of a sketch taken from a 1830 document showing the coal mines on the Sweeney Hall Estate around the Coed y Go area. Note that the Old and New British pits had not been dug at this time. 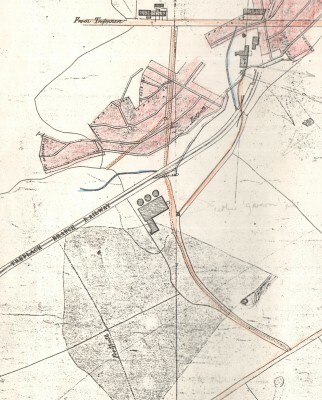 1901 map showing the Old British pit under map ref 1680 and the New British pit under map ref 1660. The old British pit was sunk by the Croxons but abandoned and taken over by Thomas Savin who then built his full guage railway from here to Whitehaven. He later sank the New British pit. Tracing of an original document held at Shrewsbury Records Office of the underground workings of the Old British Pit at Coedygo in 1864. 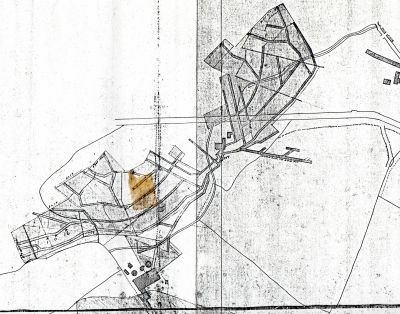 Also note that this document shows Thomas Savins full guage branch line (Referred to as The Treflach Branch Railway) from Porthywaen to his pit at Coedygo and even shows what looks like a wharf at the end of the line next to the pit. Breakdown of the strata down Savins New Pit at Coedygo. 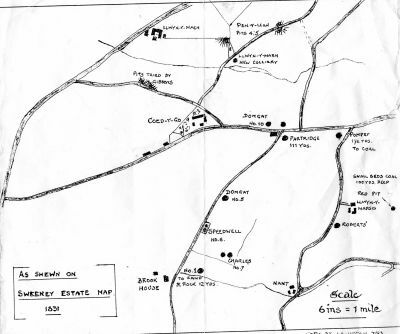 Source Memoirs of The Geological Survey of the Oswestry District. Diagram of the total underground workings of the Old British pit at Coed y Go. The pit shaft is indicated in the centre with the workings going north and south. These were started when the pit was dug by the Croxons but later taken over by Thomas Savin. This diagram is of the workings in 1865. Note the Brickworks situated at the bottom of the diagram. 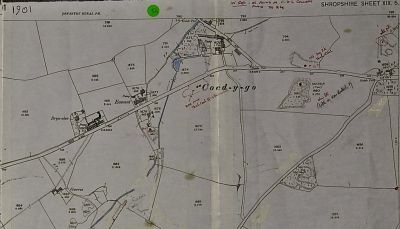 blow up of the Brickyard at Coedygo showing three kilns and a roadway leading from the Woodhill Road (Lower right corner) and travelling north past the brickyard, under the Treflach Branch Railway (Savins Railway to Whitehaven) and on up to the Morday to Trefonen Road at Coedygo. 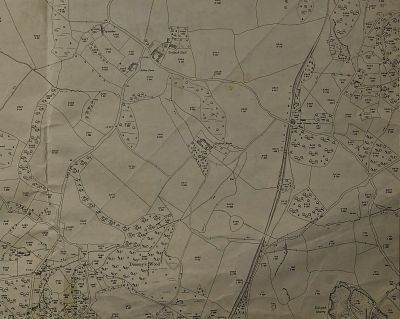 This section in the field at the Coedygo end has been examined by the present owner who suspected that there had been some sort of road going through the field. Would this scene be similar to the pit head at The British pit at Coedygo when the fatal accident occurred in the Advertizer report below? The report gives a detailed account of the scene at the pit and indicates that the apparatus above the pit shaft was 50 feet tall so would have been a lot taller than the one in the sketch. The report states that the half ton barrel being used to lift water out of the mine came up with such force that it flew over the pulley and landed on the far side of the building, crushing the poor man who was unfortunately standing there. 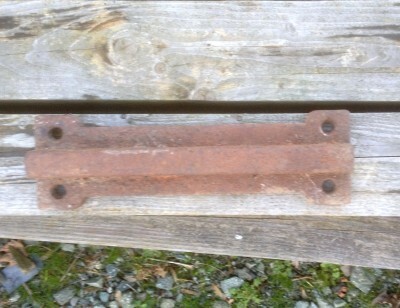 Piece of narrow guage track, found in the field near to the Old British Pit site by the present landowner, Larry Brown. This may have been used to bridge the gap between the pit shaft cage and the narrow guage track at the edge of the pit. 1863 Thomas Savin opened a railway line to the coal pits at Coed-Y-Go Nr.Morda The line closed 1869 total length 2 miles. 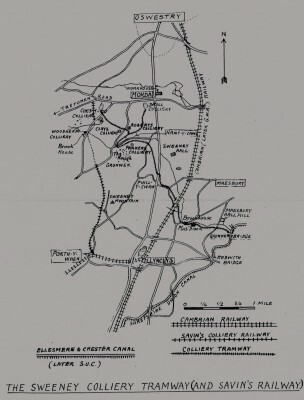 Sketch plan of the two tramways leading from the Drill Colliery and the Coedygo Colliery leading down to the Montgomery Canal at Gronwen Wharf. Also showing the suspected route of Thomas Savins Railway from Coedygo to Porthywaen. 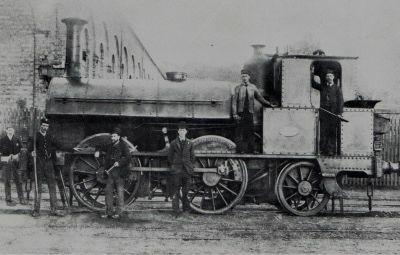 One of Thomas Savins engines "Plasfynnon, named after his house in Middleton Road, Oswestry. 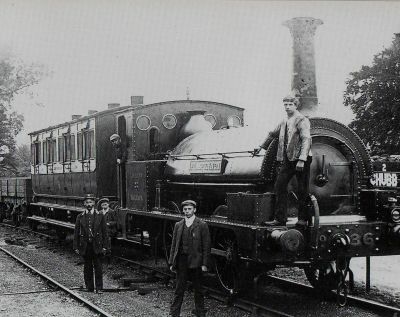 This engine, together with two others named "Milford" and "Little Tiny" operated on his track between Whitehaven and Coed y go.. 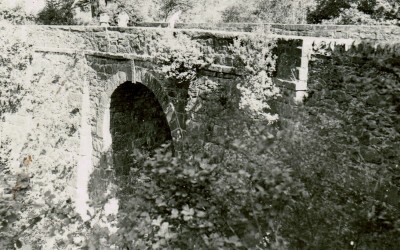 Note the high smoke stack which resulted in the high arched bridge which he constructed at Woodhill. Round about 20 trucks a day left the Coed y Go colliery loaded with coal and bricks to the Cambrian main line at Whitehaven. This photo was taken of the engine on the Kerry branch line, which Savin and David Davies built. Photo of Milford, outside the Railway Works at Oswestry. Date unknown. Article taken from the Oswestry Advertizer dated 8th January 1868 into the inquest of Thomas Jones, a fireman at the Old British Pit. Post card believed to date from the 1940's of Savins railway bridge at Woodhill. 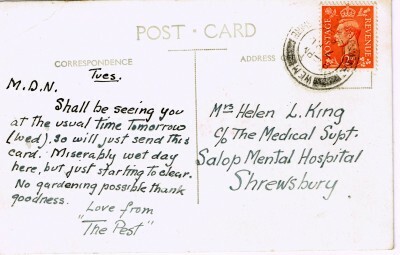 Rear of the above post card. 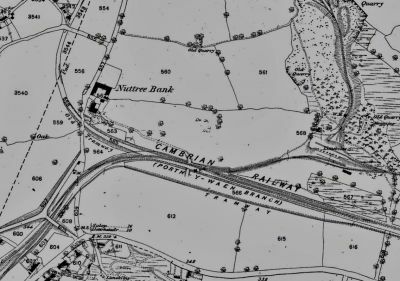 1875 map showing the trackbed of Thomas Savins railway leaving the Cambrian Railways, heading west below Nuttree Bank and then heading north towards Coed y go. 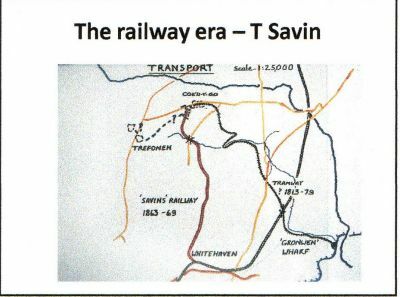 1901 map showing the track bed of Savins railway heading north. 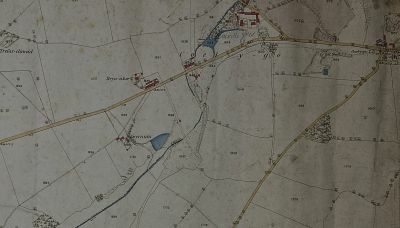 Note that it crosses a minor road and the map shows Crossing cottage farm, which would have been built for the crossing keeper. 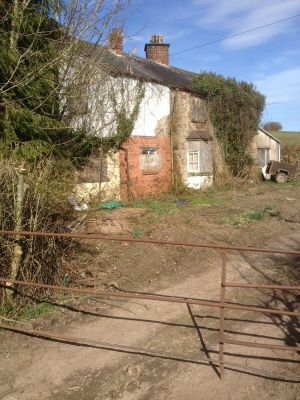 Photo of Crossing Cottage today (March 2014). The pathway leading to the side door to the left of the photograph has its original blue tiles which were mass produced at the Sweeney Brickworks. 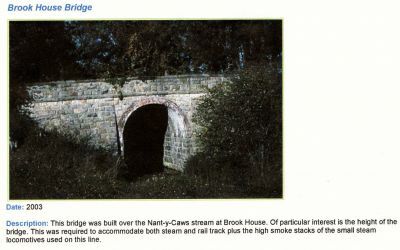 Photo of lower crossing cottage situated near to Nuttree bridge. This was the first of three crossing cottages built to serve Thomas Savins railway from the Cambrian main line going to Coed y go.